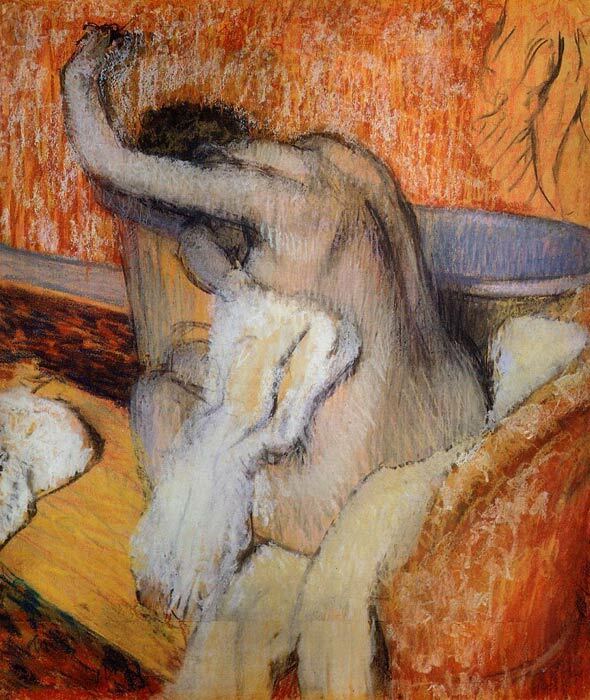 After the Bath has a connection with a series of paintings devoted to the motions of women dressing and bathing. The title of this painting is more poetic than indicative of an actual scene. The blackened bottom of the model's foot suggests that the painting was really made before, not after the bath. The casual setting is entirely fictional, and the towel and sofa are mere props for her unusual posturing. The model twists her torso in an unnatural position as the shadows contrive to decapitate her. Her contorted pose is purely formal; she does not appear to be drying any part of her body. Like many artists, Edgar Degas made photographs as preparatory studies for his drawings and paintings. SPECIAL NOTE : The painter will make the reproduction as close to the original oil painting as possible. If you want your painting to alter from this likeness, please email us and " After the Bath " will be reproduced according to your special requirements.